These Easter decor carrots are a great stand in for some of the more expensive rustic carrot decor that you can buy these days and they cost just pennies to make! Oh my goodness, I just love me some cute little decor carrots to go along with all those fluffy bunnies at Easter time! I just had to re-share this idea from a few years ago because it’s such a good one and I’d hate for it to be forgotten! Kennedy and I made these together when she was about 7, but I think we’d still have fun with them if we made them this year now that she’s almost 13. 🙂 Enjoy this old post of mine! I saw some wicker type of carrots somewhere the other day. Pinterest, Facebook… I don’t know. But I saw them. And they stuck in my brain. I had to have carrots! Cute ones too! By sheer luck, this idea popped into my head while I was waiting in the parking lot at the school later that day, waiting to pick up Kennedy. I saw a sort-of-a-version of it on some kids craft show from the 80’s once and I don’t know what made me remember it now but I’m glad I did! Oops! Got my root vegetables a little mixed up there! Happens to the best of us, right? But do you see how neat it is? We painted the carrots in various levels of orange because they do honestly look a little like parsnips in the natural color. Which is fine, but maybe not quite as cute. The reason why I’m so obviously over-excited about these carrots isn’t just about these carrots. It’s about the potential! I can make so many different things using this crazy little idea of mine. I just make a shape out of newspaper and tape and then wrap it in something! It’s going to be extraordinary! And also, I just really like these carrots. Have you ever tried making your own Easter decor carrots? Love it and what could be more perfect to go with a burlap bunny? And wow are you right the possibilities are endless! Thanks for sharing this great idea! WHY ARE THERE NO COMMENTS ON THIS??? LOVE them!!!! And I have no idea what a parsnip looks like so I’m taking your word for it that they look like bleached carrots. These are tooooooo cute! er…yum. Except for the twine part. Now see if you can make a bunny rabbit with newspaper. You are on a roll of fabulousness! What did you use to paint the carrots? These are ADORABLE? Just good ol’ acrylic paint mixed with water! Too cute! I would love for you to share this at the HOPPITY EASTER CRAFT PARTY! Just follow this link….http://sew-licious.blogspot.com/2013/02/hoppity-easter-craft-party.html. Shut the front door these are awesome!!!!!! i like your amazing details and it is so excellent for me! THE cutest ever. No joke. I crazy-pants love these, girl. but now mah feet be cold…brrrrrr…. Ok it’s a small… web?? BlogHer emailed me this post this AM and so I included these stinking adorable carrots in my Spring Craft round-up post that just went live moments ago. THEN I just saw that the Fabulous Ms.Marrs featured me and you commented! Too funny! I LOVE these carrots! Too cute! You’re stinking brilliant! Love them! You have proven that you are qualified to write on this topic. http://www.ycdress.com http://www.dressesforbest.co.uk The facts that you mention and the knowledge and understanding of these things clearly reveal that you have a lot of experience. These are absolutely adorable! Love them!!! FANTASTIC, Courtenay!! Love this project. Pinned it! These are so seriously cool and that you used such simple everyday materials makes it even more so. I would love it if you linked this project at Thrifty to Nifty Thursdays at A Jennuine Life – http://www.ajennuinelife.com/2013/03/thrifty-to-nifty-thursdays-10.html. This is super cute! And what a great idea this is! I love the carrots! Such a great idea. I would love to feature your carrots on an upcoming post of mine! These carrots are amazing! love them! I LOVE LOVE LOVE these!!! You did such a Fantastic job!! Thank you so much for stopping in and sharing at Knock Our Socks Off!! I love these and I just happen to have some of that grassy stuff you are referring to! I am off to pin this and will give it a shot! I would love it if you would link this up at my In and Out of the Kitchen link party! It is live right now and will run through Wednesday evening. How cute!!!! These carrots look adorable! What a fun craft! I just made these! It was so easy and I’m about to paint them to see how they turn out. I haven’t added the stems at the top yet because they local WM had NOTHING! However, I don’t think it will be a problem to add them later as I left space. I’m adding them to a burlap wreath and am super excited to see the finished product! Thanks! What mixture of acrylic paint & water did you use? Make it a watery “dye”? Made these FAB carrots this afternoon! So fun and so easy! I used orange tempura paint cuz that’s all I had. I cut some leaves from cane we have growing at our place. Just.. great ! Love it ! I just saw my sisters pin of your carrots and had to check them out! You did a fantastic job! I’ve got to make some to hang on my front door….they will look so cute! Fantastic Idea!!!! These are great! 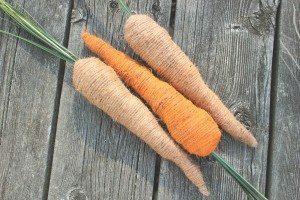 I ‘ve been trying to figure out how to cheaply make carrots for a wreath I am making. Fake carrots are an average of $3 each! Who has time for that? I was even considering paper mache or sewing felt ones. This seems fast. thank! I just made these! They turned out just like yours’ and I love them! I didn’t have newspaper so I used lined paper but worked just as well. Thanks for the idea!! If you have other kid-friendly craft ideas, we’d love it if you would submit them. If you would like to display a featured button on your site, you can grab one from the right side bar of your post above. Thanks for a great project idea! I just adore these! I cant wait until easter now!! Thanks, Jessica! You’re so sweet! I think I may have to come check it out just based on your awesome blog name! Great idea! Was just looking at purchasing some artificial carrots for a snowman wreath I want to make, but found this instead! I think will look very cute! 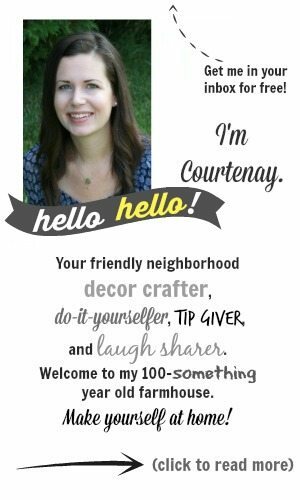 Have you tried dying the twine or just painting it? I just made these and everyone is asking where I got them!! Thank you for the idea! These are way too cute! What a perfect decoration for this weekend! I just may have to make a few of those for the front door. Do anyone have step by step instructions on how to make these including a list of items needed? Does anyone have step by step instructions on how to make these including a list of items needed to make them? I’m lost! Draw a carrot on newspaper Then what? Ok thank you! Can’t wait to make!